Omega 3 fatty acids combined with Soy Isoflavones, MCT's, Rosemary Extract and Vitamins B1, B2 & B6. This combination has been specially formulated for women for PMS and Menopausal symptoms. 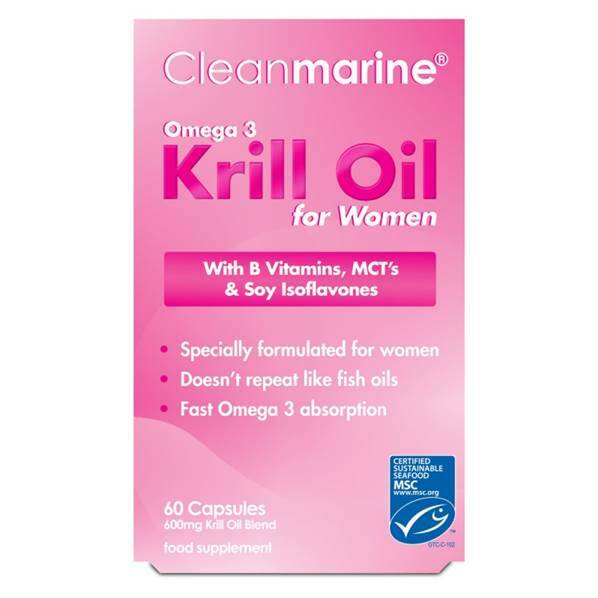 A comparison of effectiveness of Krill Oil vs Fish Oil for PMS found that Krill Oil scored better in all measures: abdominal pain/bloating, breast tenderness, weight gain, stress, irritability and joint pain. Isoflavones are a class of phytoestogens and soy products are the richest sources of Isoflavones in the human diet. Soy may support better menstrual health by favourably altering oestrogen levels and oestrogen metabolism. Krill also contain a powerful natural anti-oxidant - Astaxanthin - which gives them their reddish colour. Astaxanthin helps keep the oil fresh and pure and provides you with an anti-oxidant boost. Fish oils do not contain Astaxanthin and an anti-oxidant often has to be added during the production process. Krill are very low down in the food chain so that even if there were pollutants they would accumulate extremely small amounts. Fish are higher up the chain and therefore can accumulate a lot more toxins. MCT Oil, Rosemary Extract, Soy Isoflavones, Beeswax, Soy Lecithin*, Pyridoxine (Vitamin B6),Thiamine (Vitamin B1), Riboflavin (Vitamin B2).